What does it take to start a conversation? Face it, social media can feel like a bit of a blind date sometimes–there’s no guarantee that you’ll get a response, or what the response will be, positive or negative. But, rather than be discouraged, or stop before you start, consider that honing your message will help a great deal–putting goals in place before you start for what type of exposure, engagement, and interest you’d like to create, and defining measurable metrics that coincide with your business goals. Content is still King. 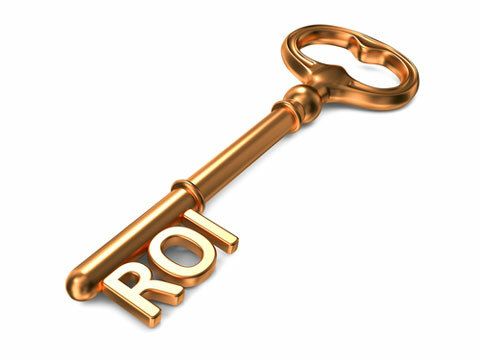 While “ROI” (Return On Investment) means “King” in French, it’s Content that will attract an audience. “What you put out, is what you get back” plays out in a very literal sense when it comes to social media, and people have been sold to, advertised to so much that they’re fed up with it. They don’t want to be preached to, treated as “consumers” (rather a dehumanizing word, really), bombarded with ads all the time. At the same time, people have needs that need filling, issues that need to be resolved, and it could be that your business could help them–without being overbearingly. Engage, not enrage! People are more apt to pay attention to what they’re interested in. George Takei has a nearly 8 Million fans of his Facebook page (that’s a lot of influence! ), and mostly what he posts is humor. In fact, I notice that most of what he posts, fans have posted on his wall and he reposts–so he’s reached a level of influence that content is even provided for him by eager fans (who’d like for their post to be noticed by 7,834,245 people, especially by Takei, himself). Good imagery is key, too, as well as interesting videos. And of course, relevant content with information that people can use is also key–for then people will be referencing your site. 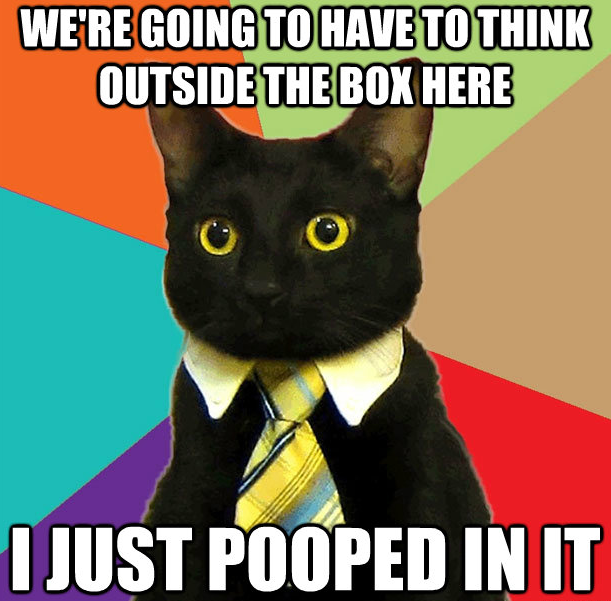 The most interesting content seems to be the creative, out-of-the box content, that either cause people a shift in perspective, perhaps through being startling, or clever, or that which provokes an emotional response (laughter is the emotional response to humor). One thing to remember is, that while people are interacting with social media through computers, phones and tablets, it is still human beings on the receiving end–human nature still comes very much into play. And human nature has not changed that much in a few hundred years. Once that conversation gets rolling, with participation, be sure to answer back promptly, whether it’s a comment on a blog your business has, or on a Facebook post, tweet, what have you–conversation is a two-way street, and even a complaint can lead to a converted, satisfied customer, provided you address their concerns in a timely and appropriate manner. 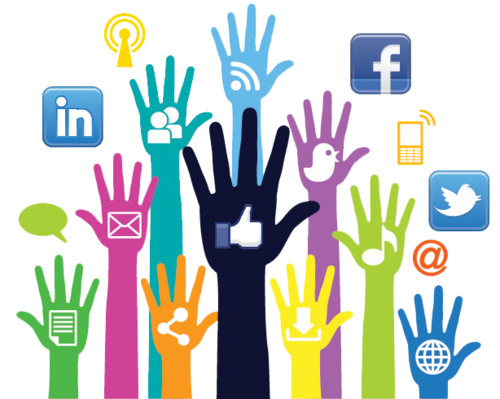 Many businesses are now using social media for their customer care–it can be a very important touchpoint. While the expense of having teams of people monitoring various social media outlets to field issues (and they have to have access to operations to do this effectively, so internal communications have to be in place), it’s potentially less expensive than maintaining a call center to handle the same sorts of issues–without the annoying voicemail prompts for the customer. 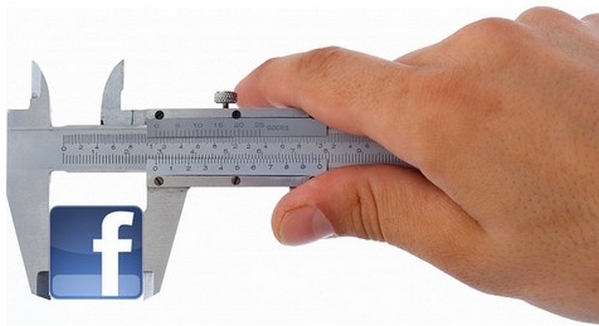 So how do we measure customer engagement? Reach? Influence? Impact? 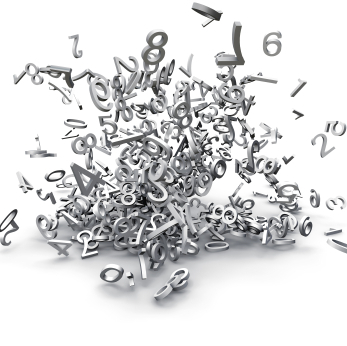 How do we make sense of the senseless jumble of numbers of likes, shares, pins, tweets & retweets, etc? How do you quantify conversations? From a business standpoint, how does this translate into money? Well, it doesn’t, at least not right away. But with “word of mouth” happening on a global scale, you can bet that eventually, it will. And you want to join in on that conversation, influence it when you can, because the whole conversation is out of your hands. The best you can do is take the wind that fills your sails, and steer. 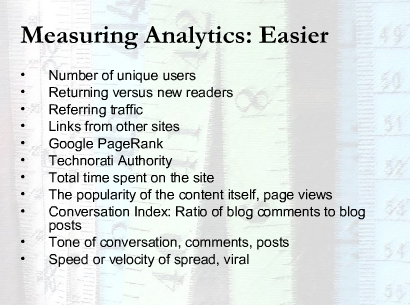 Metrics are the details, the numbers, the “likes, tweets, posts, pins, followers, visits, views, comments,” etc. They are derived from analytics, and many social media platforms offer great ways to visually represent them over a period of time in graphs, so that you can observe trends. Key Performance Indicators, on the other hand, is more like “the big picture”–metrics are the trees, but KPI is the forest, so you can step back and see what your data is telling you. How are people engaging? Who is engaging? (demographics) How often? Do they “bounce off” or click through to your blog or webpage? You can tell more from trends than you can the numbers themselves. If you set benchmarks for yourself–based on a starting baseline of where your business is at now, and where you’d like to be in 3-6 months, for instance, KPIs can be useful to pinpoint what needs more work, or what is working. For instance, if your business is getting a lot of click throughs from a call-to-action from Facebook to your website, but those are quickly leaving your site (bounce-rate) without going further, it could be there’s an issue with your landing page, such as being unclear or has a frustrating to a user. 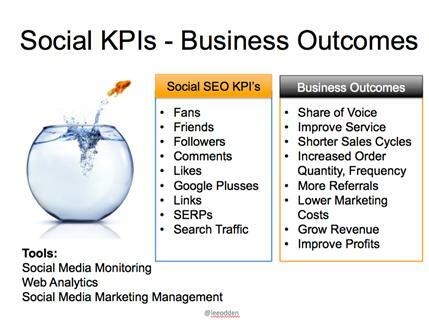 Just like the marketing funnel, there are funnels for social media and KPIs as well. One starts out with Exposure (Awareness), moves into Dialogue with customers, then Interaction, Support, Advocacy (when others are talking up your product or service and essentially selling you to their friends, and finally, Innovation. Reach is how far your message extends, how big your audience is (in George Takei’s case, for instance, that would be nearly 8 million just on Facebook). Velocity is the speed at which something travels over social media over time. “Viral,” for instance, has an exponential velocity. It’s a good idea to start promoting a product before it launches, to increase interest–a “teaser,” if you will, and that can spark velocity, as well. Share of voice is the percent that your brand/business is mentioned through social channels. My last blog has some ideas on how to track this and other KPIs. Dialogue is where the conversations start to happen, with audience engagement, posts, sharing, linking back, etc. Conversation volume can be measured by the unique visitors exposed to a brand across various social media channels. Interaction gets sparked from here, Support picks up the pieces if any get broken along the way, and Advocacy will keep your brand alive, by sharing and feeding back into exposure, contributing to conversations–just keep them happy, at all costs! Find your advocates and nurture them, if possible. If they blog, and like your product, send them more, so that they can write up about your company and then their fan base may tack on to your fan base. 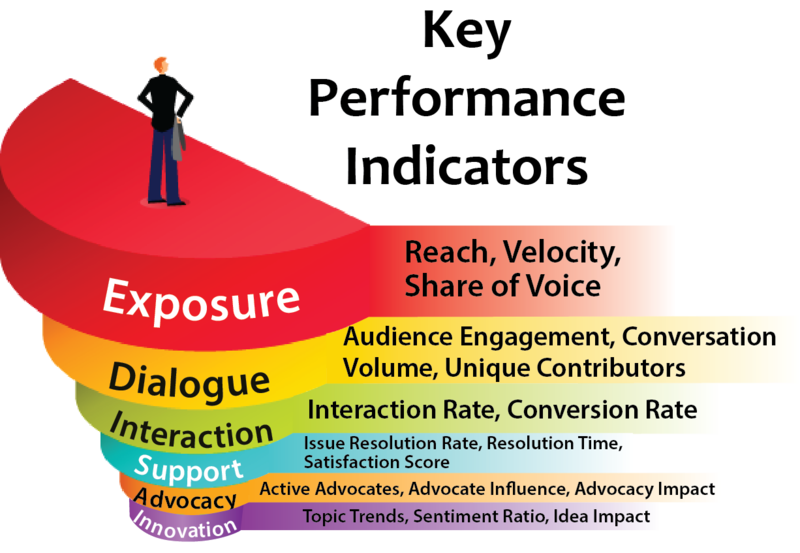 Advocates can help your impact in the social media market most of all, and impact is what leads to sales, which is, after all, the bottom line. And they don’t do it through “selling”–that’s the best part, but by simply liking and sharing. Lovett, John N. “Embracing Social Analytics” & “Using the Social Analytics Framework.” Social Media Metrics Secrets Do What You Never Thought Possible with Social Media Metrics. Indianapolis, Ind. : Wiley Pub., 2011. Print. Evans, Dave D. “Objectives, Metrics, and ROI.” Social Media Marketing an Hour a Day 2nd Edition. 2nd ed. Indianapolis, IN: Wiley, 2012. Print.